The final week of Project Gastronome is here! To recap, each of the last three weeks has had a theme - Animal, Vegetable, and Potable. This week I just wanted to fill in the blanks with whatever I found, so I decided just to call it "Questionable" and have some fun. I'm pleased to report that I still have intact vision after Friday night's experiment with prison wine. I also have a ticked-off six year-old who didn't understand why I waited until he was in bed to record the tasting. One of my regular readers is a police officer. Not only a police officer, but somebody who I see at church every week! As funny as I know it would be watching Blake tasting Daddy's silly juice, I just was not prepared to deal with those repercussions. Not that he understood that. Anyway, tonight's entry needed to be something kid-friendly so that I could bring him back into the loop. Seriously, he asks me about this every night now, whether we're going to be recording something. He's going to be crestfallen when the project ends. Today's item is Thanksgiving Dinner Gumballs. 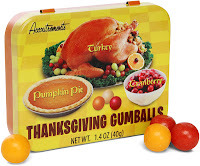 They come in three flavors, Turkey, Cranberry Sauce, and Pumpkin Pie. I chose these for a couple of reasons. Remember the miserably failed fizzy cupcake drinks? I was drawn to those because they made me think of Willy Wonka, and so does a chewing gum that contains a meal. The second reason is even sillier. Have you ever seen the holiday packs that Jones Soda releases each year? My big culinary weakness is trying different flavors of soda. Most places have the same drab assortment in the cooler or in the fountain, but just ask Courtney - if we go someplace that has something unusual, that is what I'll be drinking. A big, big dream of mine is to make a pilgrimage to Galco's Soda Pop Stop in Los Angeles someday... Anyway, when my family got together for Thanksgiving 2005, I'd purchased that year's Jones Soda holiday pack at Target, and brought it along to share. Only my dad and brother were brave enough to experience them with me. The flavors were Turkey & Gravy, Wild Herb Stuffing, Brussels Sprout, Cranberry, and Pumpkin Pie. Here is the thing - the problem wasn't that they didn't taste like those things. The problem is that they tasted exactly like those things. I like each of those foods, but there's something very unsettling about having the taste of brussels sprouts in your mouth in the form of cold fizziness instead of hot vegetableness. Still, tasting them with Papa and Mark was a really fun holiday memory. It's not Thanksgiving right now, but I think that trying these with Blake will still be a fun memory. And I also think that I'll have to keep an eye out for this year's holiday pack and do a special holiday edition of Project Gastronome. First the video, then additional comments. Jones Soda set a very high bar. I think I was expecting a similar experience with these gumballs. They were fun, but the flavors weren't quite right. The turkey tasted like something vaguely meaty, but it was more like ham. Cranberry was fruity, but not tangy like real cranberries. Pumpkin pie was sweet and a little bit like dessert, but tasted nothing like pumpkin pie. I know this is all very nitpicky, so I should say that they were about as good as what I paid for them. I am not a fan of non-meat foods designed to taste like meat, so I commend your courage on this one.